Can Ayurveda Help Prevent Colds and Flu? The Ayurveda approach to protecting oneself from colds and flus involves boosting the overall immune system of the body. One of the key approaches is through Panchakarma, the traditional purification therapies of Ayurveda. Panchakarma effectively eliminates toxins from the body and is recommended both for healthy individuals as well as for those showing symptoms of various disorders. According to Ayurveda, our physiology is made up of doshas (functional elements), dhatus (structural elements) and malas (waste products). The three doshas are Vata, Pitta and Kapha. These three doshas are responsible for specific functions in our body and their balance is foundational to our health — whereas a loss of balance is known to contribute to disease and disorders. Panchakarma procedures help to bring these doshas back to their natural balance, thus restoring health and vitality. Stage one: During the first phase of Panchakarma, the body and the internal system is prepared for the elimination of toxins. This process is marked by 1) oliation, which means purifying the body by administering various oils both internally and externally; and 2) sudation, which means preparing the sweat glands to expel the toxins through sweat. Oliation begins a week before your treatment program with a home routine created specifically to support your individual doshic balance and state of health. Most people follow a low-fat diet during this time, while ingesting varying amounts of ghee and/or herbs. Throughout your Panchakarma program, you will enjoy a variety of both oil massages and heat treatments. The massages help move the cellular toxins from the tissues and joints and into the intestine. Heat treatments allow the oils to penetrate deeply into the tissues and also encourage the body to sweat out toxins through the skin. Stage two; Stage two involves the elimination process. Most people who undergo Panchakarma are prescribed “basti” treatments. Basti is an Ayurvedic treatment in which medicated oils and herbal preparations are introduced as an enema in order to flush toxins from the intestinal tract. Bastis offer more healing benefits than simply evacuating the colon. The medicinal effects of herbs given in this manner are able to penetrate the deeper tissues of the physiology, including the bones. Stage three: Removing toxins is not a magic solution that will keep you healthy for life. During your stay at The Raj, you will be given recommendations for changes in diet and lifestyle that will help maintain balance and support a healthy immune system. Understanding the Ayurvedic principles of daily routine and diet according to the seasons and your doshic balance, and understanding how to maintain a strong digestion are all key to keeping your mind/body system at its strongest. Over the years we have seen guests arrive at The Raj with numerous concerns ranging from high blood pressure to diabetes, MS, migraines, asthma, arthritis and more. And over and over again, we receive letters weeks after their departure telling us how their symptoms have improved. Did Panchakarma “cure” these disorders? Not at all. What Panchakarma did was to remove toxins and imbalances that were blocking in ability of the body to do what it does best: create health. If you support your immune system, your immune system will support you. I’ve never understood why brussels sprouts have such a bad reputation. Smothered in butter and sprinkled with salt, they have always been one of my favorites. Lately I’ve switched to olive oil and still love them. Given their long list of amazing health benefits, brussels sprouts are vegetables that should be added to everyone’s grocery list. I’ve come across a few tips for cooking brussels sprouts to get the most out of their health-improving benefits and the most out of their flavor. You’ll find them down at the end of the blog. But first, let’s look at what this wonderfood does for us. 1. Researchers now believe that brussels sprouts have a unique ability to protect DNA. Daily consumption of 1.25 cups of brussels sprouts was linked with the improved stability of DNA within white blood cells. –Sinigrin is a glucosinolate that prompts pre-cancerous cells to “commit suicide” – a natural process called apoptosis. According to scientists at the Institute of Food Research in Norwich, the effect is so powerful that even the occasional meal of brussels sprouts can destroy precancerous cells. –Sulforaphane (another glucosinolate in brussles sprouts) has been proven to trigger the liver to produce enzymes that detoxify the body of cancer-causing chemicals. They have also been shown to inhibit chemically induced breast cancers in animal studies. Research published in the Journal of Nutrition shows that sulforaphane can halt the proliferation of breast cancer cells, even in the later stages of their growth. 3. Brussels sprouts, especially when steamed, can help lower cholesterol levels. Apparently steaming the mini-cabbages allows them to better bind with bile acids in the digestive tract. This makes it easier for bile acids to be excreted from the body. The result is a lowering of cholesterol levels. 4. Protein! 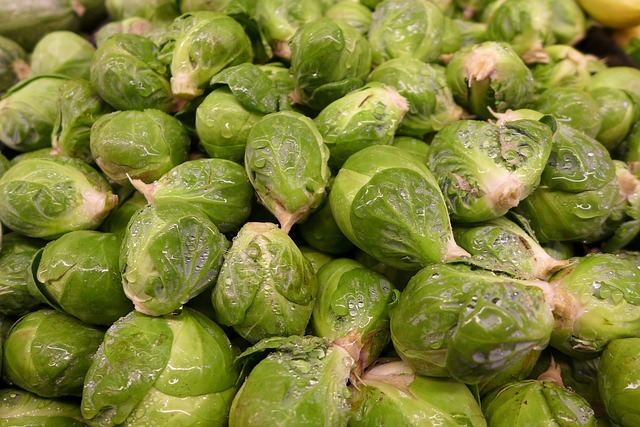 While many vegetables contain small amounts of protein, brussels sprouts have enough to make them a meat-substitute. 5. Brussels sprouts are full of things that we need: Vitamin A helps the body fight against infection (and promotes a glowing complexion). With three times the amount of vitamin C as oranges, this super-vegetable helps maintain healthy tissues and organs. The vitamin D in brussels sprouts aids in the absorption of calcium and phosphate, allowing for stronger bones. It also supports brain cell functioning. The vegetable is also an excellent source of vitamins B6 and K and contains iron, copper, manganese, magnesium, phosphorous and potassium. 6. Brussels sprouts boost fertility in men and women due to their high levels of folic acid. Folic acid helps line the womb with the proper nutrients, thus raising sperm survival chances. Folic acid has also been associated with increased sperm levels. The Washington Health Foundation recommends eating 1 1/2 cups of brussels sprouts two to three times a week. They also recommend adding additional cruciferous vegetables twice a week and upping their amount to 2 cups. Arugula, bok choy, broccoli, brussels sprouts, cabbage, cauliflower, collard greens, daikon radish, horseradish, kale, kohlrabi, mustard greens, radish, rutabaga, turnip, watercress. Overcooking brussels sprouts has two disadvantages. Not only do you lose much of their nutritional value and taste, they also begin to have an unpleasant odor. To get the most out of the vegetable, cut each sprout in quarters and let them sit for 5 minutes, then steam for an additional 5 minutes. (There is a whole science behind letting them sit after you chop them — some even suggest adding lemon juice at this stage. For now lets just say it helps activate healthy enzymes). Or chop and add to a stir-fry mix. Or, if you really don’t like the taste, chop them into tiny pieces and sprinkle over a salad. While raw brussels sprouts won’t yield the vegetable’s full nutritional value, you will still get a great deal of the benefits of this wonder-food.